You may or may not know this about me, but I have one foiled-out Commander deck. It’s tribal Vampires, Grixis colors (Garza Zol, Plague Queen), and I didn’t intend for it to be the all-shiny deck, but it is and it’s the only deck I aggressively chase foils for. As you can imagine, the foil manabase has been an expensive proposition, to the point that I only have a foil Bloodstained Mire that I opened early on in Khans drafts. The deck really wants a foil Scalding Tarn and a foil Polluted Delta, and until recently I’d resigned myself to spending a little of my Christmas bonus, likely about $100, to get a foil Khans Delta. 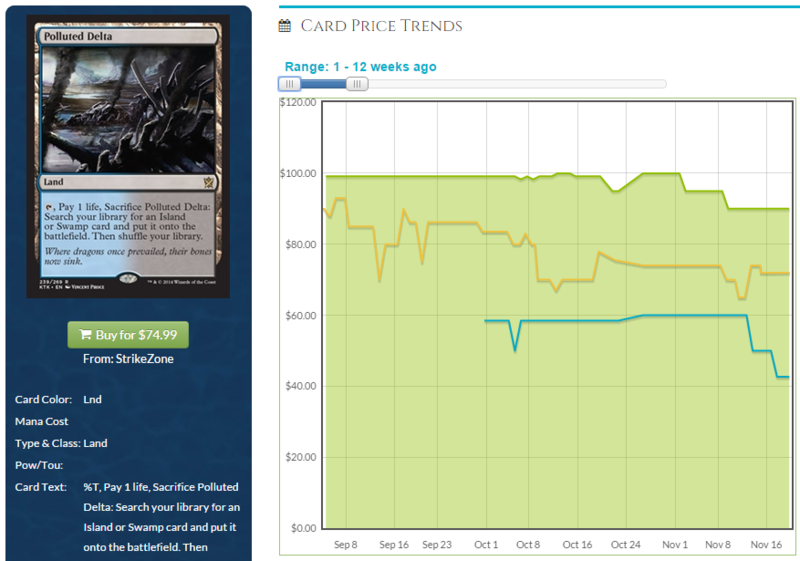 The price on eBay has gone down by $20-$30 since Battle for Zendikar came out. Now I’ll be the first to admit, I was telling you to get foil fetches when Khans block ended. That’s traditionally when the prices are lowest on things and that was certainly the case for the nonfoil fetches. Those have gone up significantly since, while the foil trends downwards. If I was a fan of foil fetches before, am I a bigger fan now? Mostly, yes. Personally, I feel that the Onslaught versions are more aesthetically pleasing, but more on that in a moment. Other writers, on this site and on other sites, have pointed out that we are reaching the floor on the Expedition lands, and that if you want them, you should get them relatively soon. I agree with this viewpoint, and if I wanted Expeditions, I’d buy them now. We will have a small amount added during Oath of the Gatewatch, but the draft format is going to be Oath/Oath/Battle so it’s not a large addition, especially at Sealed events. Also worth noting is that the rush of players who HAVE TO HAVE THE NEW SHINY has passed, for the most part. You can see the effect of these types of acquisitions on Blade of Selves, a card I mentioned last week, as it started low, spiked massively as players flocked to get the new toy, and has come back down to earth. This is what happened with Expeditions, as players out of the gate wanted these and wanted them badly. Prices were insane, the frenzy was real, and thankfully the hype has died down. As part of that hype, though, a secondary effect took hold: players spent less on the other versions, especially the Khans fetches. The foil versions of shocklands are due to go up too, but the Expeditions have sucked up a lot of the money that would have gone into Return to Ravnica or Gatecrash foil shocks. With the extra supply of Expeditions, there’s simply more to choose from. A lot is going to depend on a player’s personal taste. Are you into old-frame foil fetches? Maybe judge foils catch your fancy? Perhaps the three-quarter-art or the kooky border on the Expeditions make it worth your dollars. It’s interesting to watch how Expeditions have helped keep the prices lower on the included cards while adding a new version of those cards. One other factor to note: It appears vendors are cutting their buylists on the Khans foil fetches across the board. All five fetch lands have a decrease in their buylist price recently, indicating that they have a full stock and don’t feel they need to pay more. The buylist dip is also an indicator of retail demand. People aren’t buying as much of this version anymore, and that’s a chance for us to move in. If you want to have foil fetch lands, do it relatively soon. I’m placing strategic eBay bids and being patient, because I’m sure I can land a foil Delta at $60 on eBay, unless one you of you sniples it from me. I also want to give you a caveat: the presence of Expeditions is probably going to keep the prices of the regular foils down. Expeditions are something different and unique, qualities that Magic players love to have in their Cubes and Commander decks. The more foil versions there are, the less chance that all the money will be concentrated. Players have a variety of ways to invest their foil dollars, and that will keep all of them pretty stable in the long run. So if you pick up some foil fetches or shocks or battle lands, don’t expect a huge return anytime soon. I do think they will slowly go up in value, but this injection of supply will keep prices low. One more thing about Expeditions: There are more yet to come. Speculation remains rampant, but most agree that the 20 Expeditions of Oath will be the new five battle lands, the ten filter lands, and then five more. 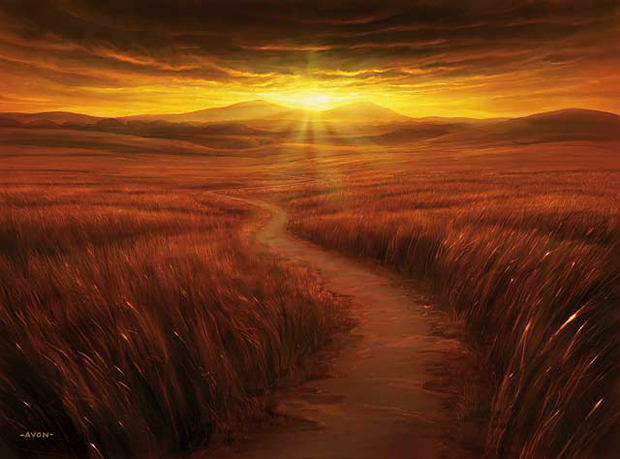 Those other five might well be the Scars of Mirrodin ‘fast lands’ like Seachrome Coast, since it needs to be a cycle of five. Regardless, I’d expect the pre-existing foils to take a hit on their prices, so if you’re sitting on a playset of foil Twilight Mire, you might want to think about selling high.